I want to be president someday, so I have not smoked marijuana. I ate a brownie once. At a party in college.It was kind of indescribable really. I felt like I was floating. It turns out that there wasn't any marijuana in it, it was just an insanely good brownie. --Leslie Knope, Parks and Recreation, "The Stakeout"
This is an insanely good brownie. 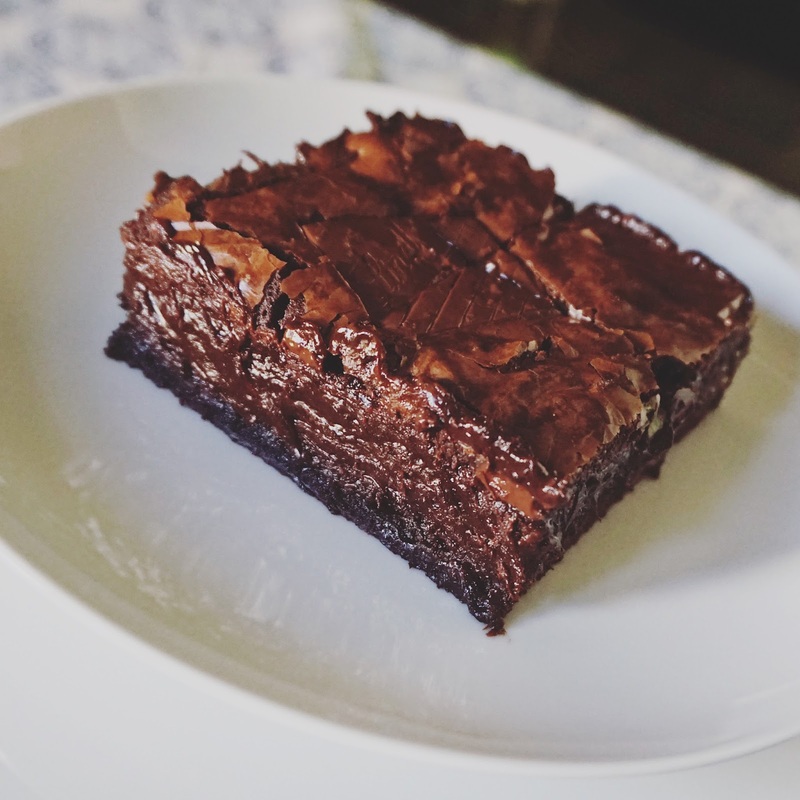 I've mentioned before that I'm not a huge fan of brownies (besides just nibbling the crusts) and I had found another recipe fairly recently that I was satisfied with for a while. I don't know what made me suddenly crave them--maybe being holed up inside due to the weather, or maybe that quote above from Parks & Rec, my new favorite show. I finally sat down and devoured all the episodes far too quickly for my own good. Aaaanyway, I used to be one of those people that made everything from scratch...except brownies. I love that beautiful crust and chewy edges that I've only ever seen on mixes. Until now. This was everything I'd been looking for my entire brownie-baking life. And I could put it together in pretty much the same amount of time as a mix. I made two batches of these. The first batch, I reduced the sugar because I didn't have any unsweetened cocoa on hand and didn't want them to turn out too sweet. They didn't form a crust at all and hardly had chewy edges, although they were delicious. They'll be mixed into an ice cream later on, not to worry. The second batch, I kept the sugar the same to achieve that lovable crust, and swapped out half the cocoa for black cocoa, which is what I use to make oreos. I also added some extra salt to cut the sweetness. I used a vanilla butternut extract that added a nutty taste to them, without the actual addition of nuts. Yes, I prefer my brownies nut-free. Any nut extract besides almond should also do. The first batch also was a bit too thin for my liking, so I made them in a smaller pan so they'd be fudgier. But the photos in Alice Medrich's book depicts them as reasonably tall in an 8x8 pan, so bake it however you must. 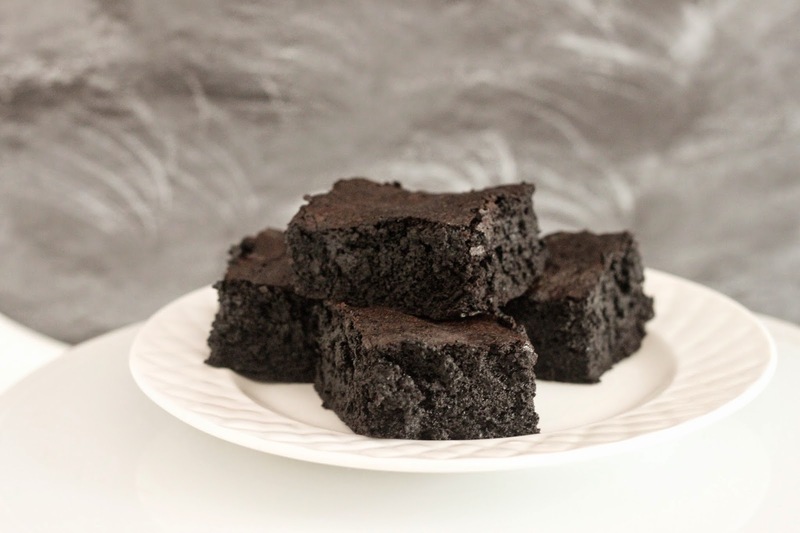 Although brownies will never be my favorite dessert, there's something to be appreciated about a rich and fudgy slab of chocolate-y goodness that's essentially frosting, barely held together with some flour. Sometimes it just hits the spot. *Update 7/20/18: I've made these about 9 times now and they're always a hit. My friends and family are in love with the chunks of coarse sea salt so don't skimp on them! Sent them to my friend who was feeling sad in a new city and her text response was "these are seriously the best brownies on the planet." Line the bottom of an 8x8 cake pan with parchment and spray/butter well. Melt the butter in a saucepan, and whisk in the cocoa and sugar until all combined (don't worry if it looks gritty, it's supposed to). Once hot, remove from heat and mix in the vanilla and one egg at a time, beating well after each addition with an electric beater or a wooden spoon, or a rubber spatula. Mix vigorously until the batter becomes glossy and shiny (the more you mix, the more of a lovely crust you will receive). Gently fold in the flour until combined, no more than 40 strokes. Spread the batter evenly in a pan. 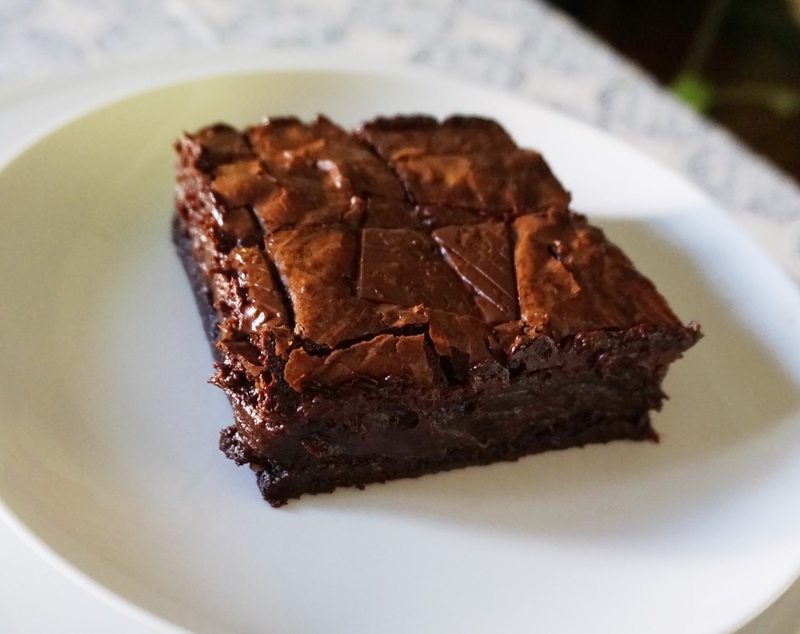 Bake for about 20 minutes and then remove and slam the brownies on the counter several times to release any air bubbles--this will make the brownies fudgier rather than cakier. At this time, sprinkle the salt over the top before putting back in the oven. Bake for 20-25 more minutes. 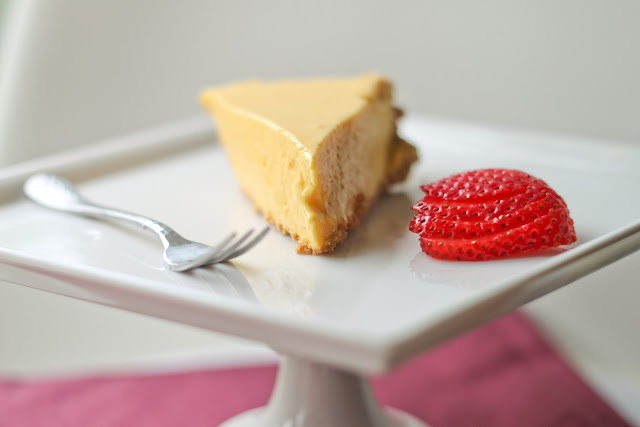 Check doneness by inserting a toothpick in the center--as long as no wet batter comes out it's done! *If it's completely clean, you've over baked it, in which case, place straight in the freezer to cool down quickly (it may still be salvaged). If they are truly overbaked, chop into cubes and fold into ice cream. If you manage to make these last more than a day or two, store them at room temperature in an air tight container. Holy. Moly. That looks insane. Thanks for making me drool at work. Now I must go home and make this brownie. Immediately! What brand do you use for the vanilla butternut extract?